A few days ago, I made one of what, recently, has become a regular haunt, the Waterview Sanctuary at Sorell. I always start by making a b-line for the water's edge, looking, almost in vain these days, for any migrant waders that might be feeding on the mudflats. Surprise, surprise! A solitary, overwintering, Eastern Curlew, feeding among a small group of Chestnut Teal, but sadly that was the sum total. A quick scan of the fence poles surrounding the chicken factory to sus out the almost resident Brown Goshawk drew a blank, so I wandered along the line of African Boxthorns, bordering the factory. These boxthorns, a noxious weed in Tasmania, are presently the home and a food source for many small birds. As you walk along this line of shrubs, you can see why they were once popular in place of fences. With their long sharp spines, and their ability to grow almost anywhere, and forming impenetrable thickets, they must have been a godsend for early settler s looking for cheap 'fencing'. 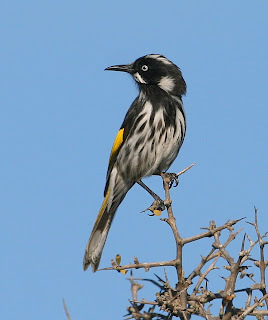 On this particular morning, there were numerous New Holland Honeyeaters, many of them now in pairs, several Crescent Honeyeaters, almost all males, small flocks of Silvereyes, feeding on the still green seed pods of the boxthorn, family groups of Superb Fairy-wrens, and the ever present Blackbirds and House Sparrows. 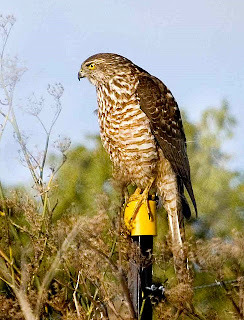 As I walked towards the link fence of the chicken factory, the honeyeaters frequent calling, stilled, and almost simultaneously I realised that about 30 metres away, atop a fence post was the immature Brown Goshawk, very animated, and obviously intent on catching breakfast, no doubt drawn there by the to'ing and fro'ing of birds. I say the Brown Goshawk (pictured top right), as there has been one here most of the Autumn and Winter. Although I tried back tracking, my presence was obviously too much for the hawk, and it soon flew off, flying only a few centimetres above the ground, before propping again atop another post. The hawk was briefly mobbed by a few Forest Ravens, but the hawk seemed unperturbed and they soon gave up. The honeyeaters reappeared from their thorny refuges, many sitting on the topmost parts of the boxthorns, keeping a wary eye out. 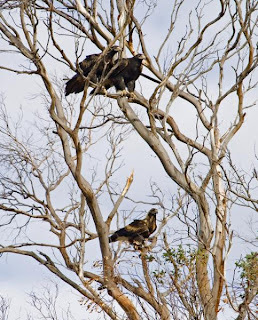 In the case of the New Hollands, (pictured at right), they were also keeping an eye on each other, and they spent a deal of time chasing one another. As I wandered back to my car, I was delighted to see what was once a common resident here, White-fronted Chat. A pair were sitting on a strand of barbed wire and seemingly reluctant to fly. I photographed them (female at left). Perhaps they're making a welcome return to this area, but I think it more likely they're on their way to nearby Orielton Lagoon. There may not be many waders these days, but the Waterview Sanctuary is still worth a visit, with the possible bonus of the Brown Goshawk. I drive past the Lauderdale end of Ralph's Bay on many occasions, it's only a 10 minute drive from my abode. As I pass I often look, make that, always look, out across the bay, scanning for waders. At this time of year, apart from the flocks of Pied Oystercatchers, I can often see other small waders, scattered across the bay, feeding. But, to be honest, I rarely stop to identify what's there. A few days ago, while returning from an outing to the South Arm area that had only been mildly interesting, I spotted a few small flocks roosting close to the road and decided it was time to have a closer look. Winters, and put on weight for the return journey, what is it that makes Tasmania unsuitable for breeding? The flock at Lauderdale consisted of about 35 individuals, roosting in the pebbled area, only a few metres from the highway. 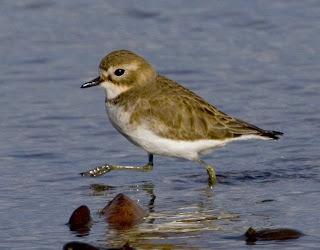 With them were 20 or more Red-capped Plover and a few overwintering Red-necked Stint, all spreading out on the falling tide, as they began to feed. 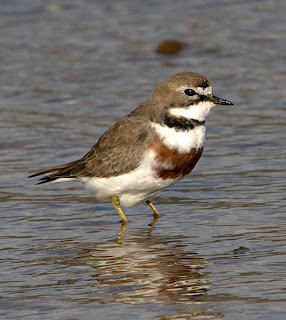 My main interest in the Double-banded was to get some useable shots of birds in their breeding strip, showing the two bands, and I reasoned that as they should be leaving our shores in August, they should be nearing full breeding plumage. So I was a little disappointed to find that only a few of them were anywhere near that stage. Plumages ranged from that of near breeding plumage of the bird at top left, to that of the individual at right, that still has a long way to go. 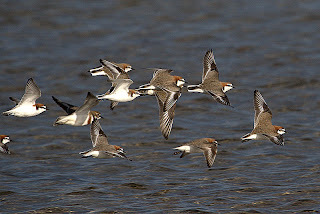 The lower shot shows a part of the Red-capped Plover flock (and a solitary Double-banded Plover), which appeared to have a preponderance of males. In contrast to their slightly larger New Zealand cousins, they were all resplendent in their breeding plumage. Probably not surprisingly, as they are usually early breeders and I have found nests as early as late July, only a few weeks away. Ominously, a floating drilling platform was operating not far away, as this area is under threat of being developed into a canal type housing estate, and this area is a 'conservation area'! Over the last several weeks I've been sent a number of shots of White-bellied Sea Eagles, and I've had a few close encounters myself. But the weather has been indifferent to awful (but we badly needed the rain), and any chance that I've had to photograph them has been minimal. All that changed recently on a drive round Bellerive Bluff. There was a strong, gusty, South westerly wind blowing, with occasional passing squalls, and in those conditions, I often try my hand at photographing gulls in flight. These conditions often mean that the larger gulls, Pacific and Kelp, will "hang" in flight, just off the bluff, giving me a chance of reasonable results. I had taken several shots, when a passing shower made me take cover back in my car. The shower appeared to have passed so I got out, this time without camera. I scanned the sky for a break in the clouds, satisfied that a break was imminent, and casually looked up as I wandered back to my vehicle to get my camera. Aha! 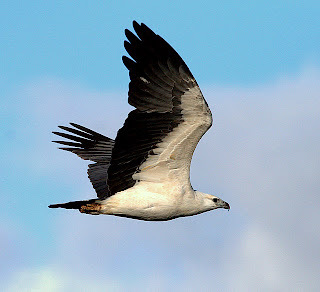 High above me was a solitary adult White-bellied Sea Eagle, soaring majestically, almost stationary as it rode the wind. Magnificent, but far too high for any worthwhile shots, so I contented myself with watching it through my binos. 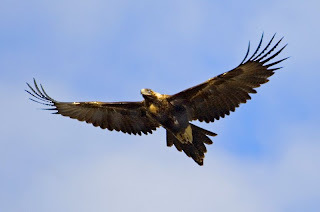 I momentarily took my eyes off it, and when I looked back the eagle was in a near vertical dive, wings folded back, and traveling at considerable speed. I panicked at this point, unsure of whether to grab the camera or just watch, and I tried to do both! I was most interested to record its possible victim, which I fondly assumed was a fish. Wrong! It was in fact a 1st year Kelp Gull flying past some hundred metres away. It saw, or perhaps heard, the eagle's approach, and jinked at the right moment (right if you're the gull! 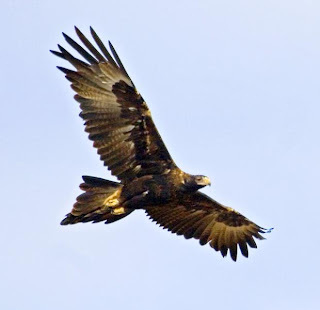 ), and the eagle flew on towards Bellerive Beach and out of my sight. Cursing that I'd not even got a record shot of the, albeit, distant event, I consoled myself that I had at least witnessed the exciting episode. Standing there, still mulling over what might have been, I had failed to notice that, like the gulls I had been photographing earlier, the Sea Eagle was now just in front of me, drifting past into wind. Snapping back into reality, I just had time to take a few shots, one shown here. It then hung in the updraught at the edge of the bluff, not more than 30 metres away, but tail on to me, before sliding away along the coast. I really must stay more alert!